Now why would a dentist be talking about sleep apnoea? Sleep apnoea is a sleeping giant (joke). It is something that we have all taken for granted & nearly all of us know a snoring joke or two. The problem is that we now know that sleep apnoea is no laughing matter. Sleep apnoea has recently come under the gaze of the medical researchers, & they don’t like what they see. Sleep apnoea is a not so silent killer. It increases your risk of heart failure, diabetes, stroke, & high blood pressure to name just a few. It decreases your life expectancy by 8-10 years. Sleep apnoea sufferers have a high incidence of headaches, reflux, & grinding their teeth & feel tired & “cranky” during the day. And why not? If you have sleep apnoea, you may have been in bed for 10 hours, but have had only 1-2 hours of “real sleep”. No – one can feel rested, or recover from any medical or health problem after that. The most common cause of sleep apnoea is a blockage of the airway during deep breathing while asleep. This blockage may be due to 1/ overweight 2/ the epiglottis or 3/ the mandible (lower jaw). That’s right! 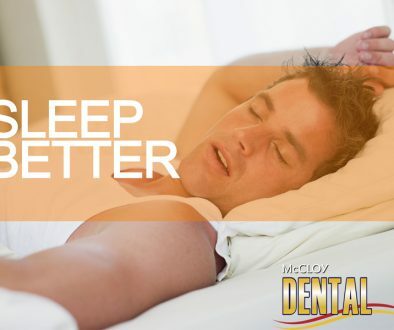 Sometimes dental treatment, which changes the position of the lower jaw, or a night guard to stop your lower jaw from falling back, can stop you from suffering from sleep apnoea. The golden standard of treatment for sleep apnoea sufferers will always be a CPAP machine. But not everyone wants to use one. They are a little antisocial. Some people will be lucky enough to be in the group for whom repositioning the lower jaw will work. The difficulty is to determine who is in that group without wasting money & risking your health by investing in an appliance, which will not work for you. At McCloy Dental, we can solve this problem by checking your airway on our pharyngometer. This measures the volume of your airway normally, when asleep, and if we move your jaw so that we can accurately predict if the treatment will be successful for you. We also have the ability to run a mini sleep study afterwards and check that the quality of your sleep has improved. Don’t get us wrong, we don’t mind if you go to sleep while we are working on you – it happens all the time. We just don’t want you to snore. We believe in safe sleep! This is just another example of the difference between us & other dentists. We focus on your whole health, not just a tooth, or a filling.